Deacon Harold Goodman, Chairman along with Mother Wilma Roundtree, 30-year member of the health education ministry, recruiting volunteers for the 41st Annual Holistic Health & Job Fair to be held Sat., August 11 at Allen Temple Baptist Church. Photo by Sue Taylor. For over four decades, Allen Temple Baptist Church has offered its annual health fair free of charge and open to the entire Bay Area community. 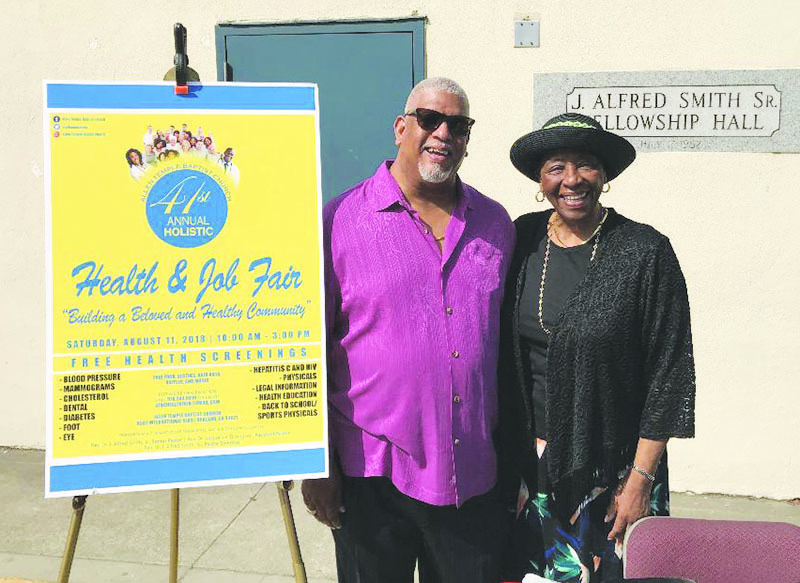 This year is no exception and the church, with partners and volunteers, is preparing now for the 41stAnnual Holistic Health & Job Fair on Saturday, August 11, 2018, from 10 a.m. to 3 p.m. The Family Life Center at 8501 International Boulevard, will be abuzz with free health screenings, food, clothes, haircuts, raffles, music, and for the first time this year, free showers for our homeless neighbors. The Horizon Clinical Services company, co-founded by Deacon Goodman, is a sponsor of the Fair and has been featured in the Post this past year. Other sponsors include AC Transit, Kaiser Permanente, and Wells Fargo Bank joining the team this year. The Health & Job Fair is intended to do the same. Free health screenings include mammograms and vision testing, providing valuable information to folks coming to the fair. There will also be physicals, legal information, health education sessions, and back-to-school sports physicals. The annual backpack and school supply giveaway also happens during the Health Fair. Donations are welcome each Sunday morning at the church, and 7 a.m. to 1 p.m. on Saturday, August 11. Children in grades TK through 12 must be present and complete health screenings to receive a backpack. Mother Wilma Roundtree, who has been a member of the Health Education Ministry for over 30 years, said she wants to remind the community that blood pressure, cholesterol, dental, diabetes, foot, and eye screenings will be provided. For more information: call 510-544-8910, or email [email protected].